Under £50 Festival Outfits with Boohoo! Well, Festival season is almost over! Heading to a festival in August/September? Need an affordable but comfortable outfit? I've got ya back guuuuurl! 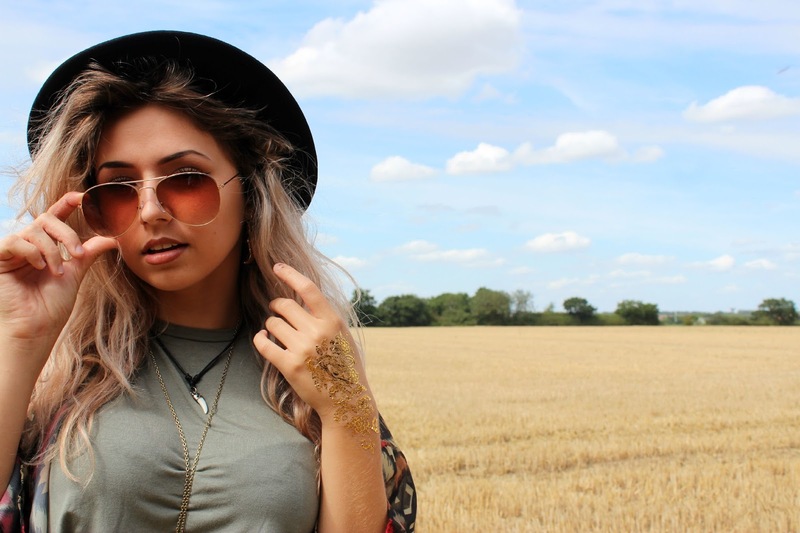 I've teamed up with Boohoo to put together a festival outfit for under £50! FULL outfit! (plus added extras) Check out the pictures below to see what you think of my bargain outfit! Fancy seeing what it's like shooting my blog photos? Check out my vlog from the weekend! Jam packed with backstage footage. I've styled up a rather toned down outfit! Plenty of neutral colours combined together to make a festival friendly outfit. I absolutely loved this khaki vest dress. It's so light weight! The price is AMAZING too. The dress comes in lots of other colours too, in case Khaki isn't your thing! This dress will look fab either with or without a belt, have fun & experiment with different looks! How damn cute is this kimono? The aztec print is absolutely gorgeous! I'm loving the length too. Being 5 ft 2 it can be a little tricky when it comes to long kimonos! So this was perfect for me. It's super light weight which is always a bonus. I loved the flared arms too. The basic layers of just dress and the kimono means that there is plenty of room for accessorizing! I'm in LOVE with both of these tusk necklaces. The shorter one is by The Moon Child - I was super excited when they said they wanted to gift me some pieces of theirs, I've been looking for a tusk choker like this for SO long! 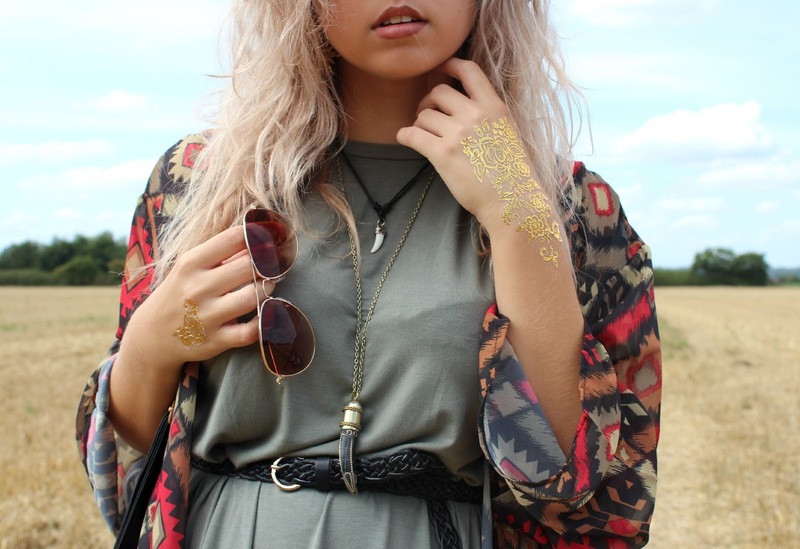 These Primark metallic temporary tattoos are a must have for festivals this year! Super easy to apply- at the BEST price! A whole sticker pad of these are just £1.50. When it comes to festivals I have to be comfortable! This is why I chose this light and easy matching outfit with Boohoo. Who's my Festival style inspiration? I've loved Vanessa Hudgens' Festival style over the past few years! She seems to transform into some cute festi-goddess which I just can't get enough of! Lately I cannot get enough of these Public Desire lace ups! These have been my go-to shoe SO much in the past month. So much so that I had to get my hands on the white pair too! They're unbelievably comfortable and the sizing is super true to fit. Big big LOVE for this Boohoo fringed bag! Fringed bags are becoming one of my absolute favourite things right now. & Boohoo have this amazing one available for only £15! That kimono is absolutely amazing, I love this look! Your shoes are awesome! I love festival outfits. You look great! Loving your outfit once again girl! And those shoes! WANT! <3 Definitely given me a lot of inspiration from this outfit!